You are here: Home » Banana Bread…or is it Cake? Banana Bread…or is it Cake? Why do they call it bread, anyway? It’s not kneaded, not risen and punched down, not yeast based; nothing about ‘Banana Bread’ is bread! Maybe it’s because it’s signature shape – traditionally in loaf pans. So should it be called Banana Loaf? I prefer Banana Cake myself – I like a cake-y Banana Bread – the dense ones are too wet and the flavour of the fruit is too concentrated. 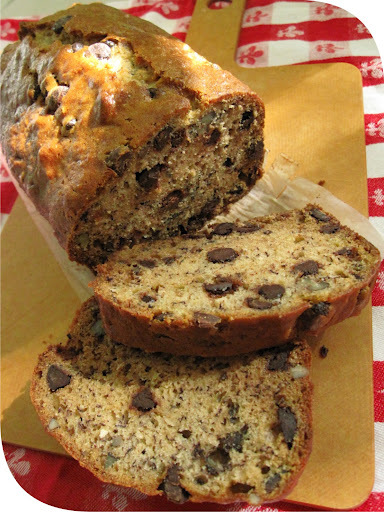 I like a little more texture in my Banana Bread/Cake/Loaf – which is why it’s studded with chocolate chips, toasted coconut, and pecans. This recipe made a massive amount of cake. I managed to get three decent sized portions out of it. They are relatively flatter than a traditional cake, but meh – more to go around! ← Cuppa cake or two?